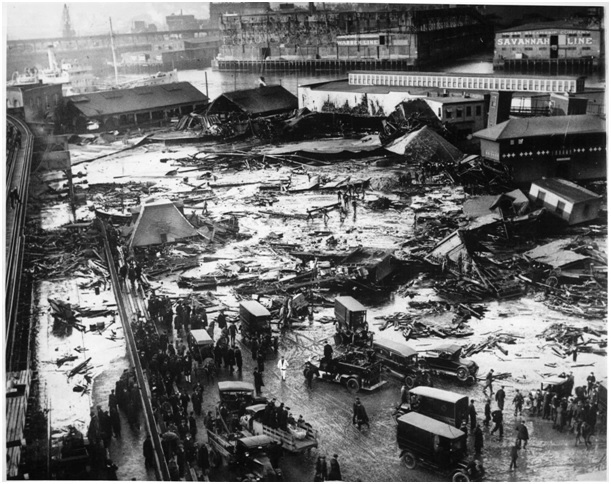 The Boston molasses tank failure is a famous incident in which 21 people lost their lives. The cause of the failure was never definitively determined even though the court auditor was presented with over 20,000 pages of conflicting testimony by prominent engineering experts from institutions like MIT and Harvard. The author has examined evidence presented in the case as well as private failure analysis reports by experts of the day in light of our current understanding of structural design, analysis methods, and metallurgical effects. There were no applicable structural codes when the tank was designed, but the practice for designing riveted structures was documented in well-known text books. The author has conducted finite element analysis to calculate the stress and strain conditions that existed just prior to failure as well as to simulate the tank collapse and flow of molasses against adjacent structures, many of which were destroyed. The case is also examined with respect to the methods we currently use to protect against brittle fracture, including the use of toughness tests and the effects of steel chemistry. The work includes discussion on the differences between the structural steel used to fabricate the tank and what we use today, including an interesting reference to the Titanic failure. Dr. Mayville is the head of the Structural Mechanics group at Simpson Gumpertz & Heger Inc. in Waltham, MA. He has a Ph.D. in Mechanical Engineering and is a registered professional engineer in both structural engineering and metallurgical engineering. He has been interested in the molasses tank failure since graduate school and has recently conducted research into the causes of the failure using modern engineering techniques.